Discover the pristine waters, beaches, rainforest & the Great Barrier Reef from Port Douglas. See the termite mounds & waterfalls of Litchfield National Park. Visit the iconic natural wonders of Uluru & Kings Canyon. 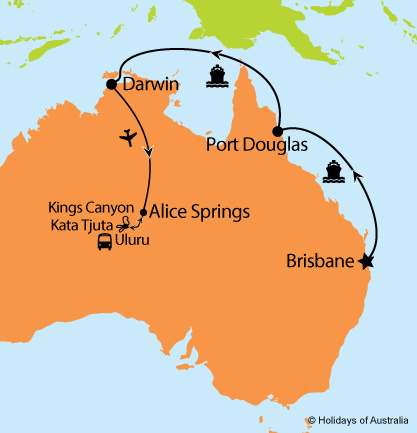 4 night Alice Springs, Uluru & Kings Canyon Adventure tour. Images courtesy of P&O cruises, Tourism NT, Tourism & Events Queensland & Peter Eve. ^Save $100 per person offer is available on new bookings only and has been applied to the advertised price. Valid on bookings made & deposited by 20 Apr 2019. Travel insurance voucher must be used within 7 days of booking, is valid only when booked with Holidays of Australia & the World and is not redeemable for cash or any further discounts.